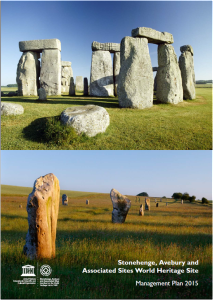 Stonehenge and Avebury WHS Management Plan 2015 is launched! The first joint Stonehenge and Avebury WHS Management Plan is launched! The first joint Stonehenge and Avebury WHS Management Plan was launched at Avebury on Monday 18 May. The event was hosted by Ian Barnes, Head of Archaeology at the National Trust. The event marked the culmination of a great deal of hard work across the many partners in both parts of the World Heritage who helped to protect and preserve Britain’s most iconic prehistoric site. The Stonehenge and Avebury WHS Management Plan 2015 replaces the Avebury WHS Management Plan 2005 and the Stonehenge WHS Management Plan 2009 and has been written by Sarah Simmonds and Beth Thomas of the Stonehenge and Avebury WHS Coordination Unit based at the Wiltshire and Swindon History Centre in Chippenham. They have been supported by numerous colleagues and individuals in its preparation and the production of the Management Plan was supported by Historic England and Wiltshire Council. The Stonehenge and Avebury WHS Management Plan can be downloaded here.